SVIMS Para, Allied Medical(UG) Degree Courses Admissions 2019 through AP EAMCET: Sri Venkateswara Institute of Medical Sciences (SVIMS), Tirupati has published the SVIMS Para and Allied Medical(UG) Courses Admissions 2019 notification and SVIMS invites the application forms from eligible candidates for admission into Para and Allied Medical (UG) Courses. Inter MPC/ Bi.PC or equivalent. The candidates for admission to the graduate courses shall have passed intermediate examination or any other examination recognized as equivalent thereto with optional subjects of botany, zoology, physics & chemistry. Inter with optional subjects of MPC are eligible for B.Sc (NMT) & DRT courses (S.No. 11&12). The students who have passed intermediate vocational bridge course with Biology & Physical Sciences are also eligible for courses S.No. 1 to 10 subject to merit in the Bridge course in Physical & Biological sciences. 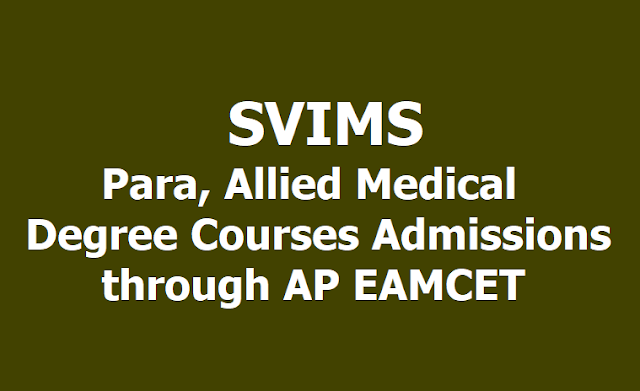 How to apply: Eligible candidates should apply through online mode at SVIMS Web portal. 1. The applicant has to approach the nearby Mee-seva / AP online centre With the following certificates. iv) Recent passport size Photo & signature of the student in white paper. viii)Permanent Caste certificate in case of BC/SC/ST candidates issued through e – seva / Mee-seva. x) Documentary proof for Un- Reserved i.e. if studied outside the state of A.P / Telangana. - (if applicable) Refer clause (9. 2). 2. For availability of Mee-seva / AP Online centres. 3. Application fee Rs. 600/- for OC, BC & Rs. 400/- for SC/ST category + processing fee as applicable.